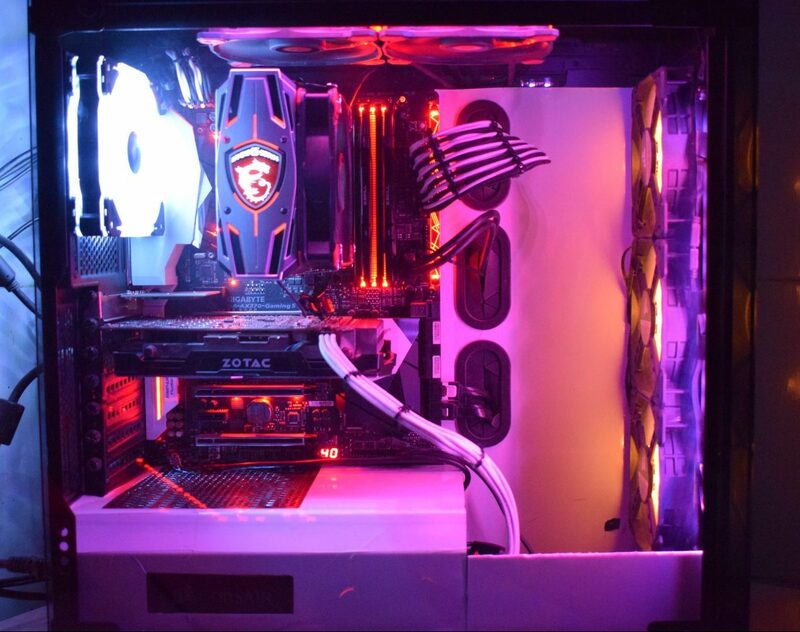 Latest PC case trend is tempered glass and RGB. Cases for several years used to have transparent window panels and they looked too good but one problem made them bad which was scratch. Even if you tried to clean that glass with a soft cloth, it would still get micro scratches easily which were permanent and then the clarity of the interior be diminished. 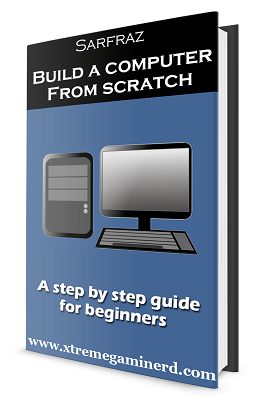 Now companies make cases with tempered glass but there are many cases which have tempered glass on more than one side and they look even better. 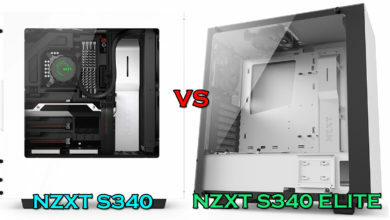 So, I have brought you the list of Top 5 Tempered Glass PC Cases that beat their competitors for their price in both aesthetics and support. If you want a completely different experience with computer case then you will find Thermaltake’s Tower 900 the best which is available in two colours: Black and Snow. So both of them are similarly priced but the only difference is colour. Rest is the same. 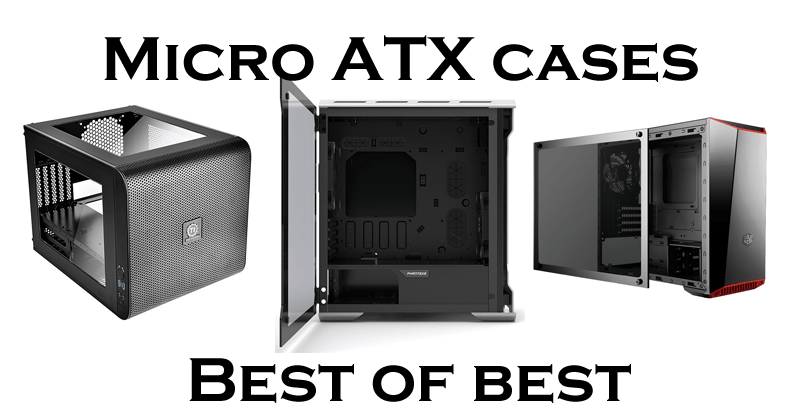 The case has exceptional support for components as it has support for E-ATX motherboards. It’s fully compatible with every type of AIO cooler or custom water loop with up to 560mm radiators. You can mount your AIO cooler radiators or custom loop radiators are the back because there are a lot of places where both the sides are with optimum airflow. PSU is also to be installed at the back and it will be hidden completely. While most of the wiring will go at the back, your main components such as the motherboard, ram, graphics cards, the reservoir will be visible from the front. 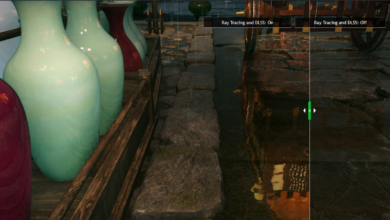 You can use two different loops for your GPU and CPU if you want to. The case is also very modular and you can change the location of your hard drives at the back where PSU shroud is present. There is also one 5.25″ drive bay at the bottom which you can use for installing a monitoring hub or a device like NZXT Hue or even an optical drive if you want to. There are two more distinguished fan mounts at the top, one which can be seen from the front and one at the back which is hidden for exhaust. As the case is vertical, it gives it a completely unique look when compared to other cases which are generally horizontal. The case easily supports multiple GPU configuration with water blocks installed on them and has several cutouts with rubber grommets for easy cable routeing. With everything modular, it’s closed by three tempered glass which will allow you to see the interior of your case from all sides. So, components compatibility, modularity, construction, cooling, everything is perfect in this case. View 71 RGB is the best mid tower present right now. 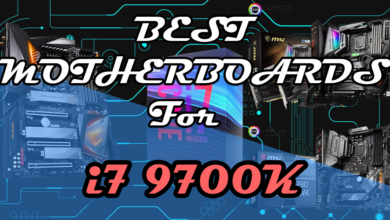 It’s a new release from Thermaltake and beats every mid tower case for its price when the comparison is done with them. 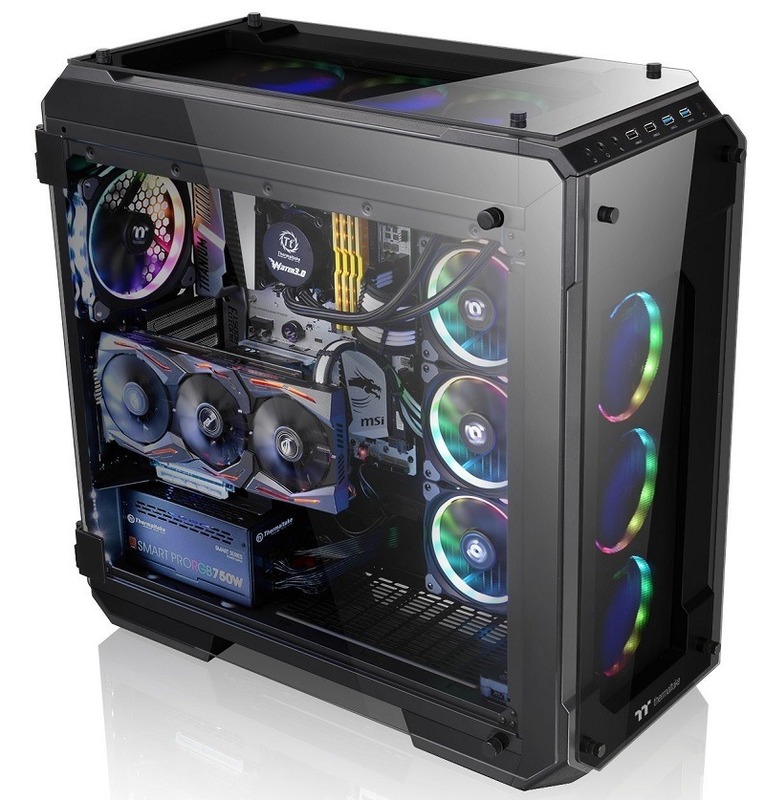 The case features 4 tempered glass panels on 4 sides. It makes it look great but at the same time, there is some limitation in proper airflow. But there are open spaces between the main body and the panels, so the fans intake cool air from sides and the exhaust fans throw hot air through the sides as well. The case has compatibility with full-length graphics cards as well as supports vertical GPU mount as it has a dedicated mount for that. 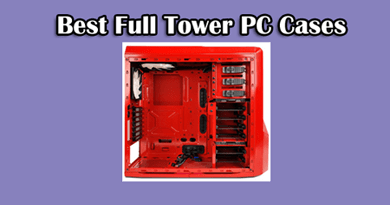 In total there are 8 PCI expansion slots as compared to 7 which is common in mid-tower cases. The fans and radiator support in this case is insane. It has a dedicated area for mounting a 360mm radiator inside or you can also install 360mm radiator at the front or at the top. 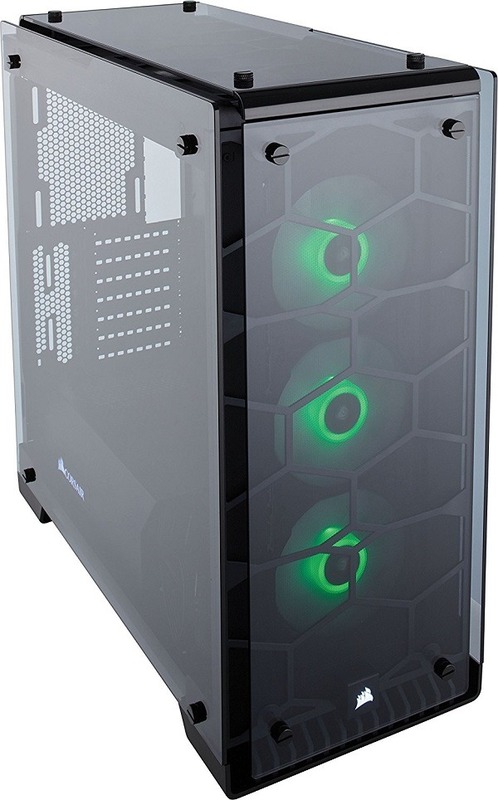 The case is RGB version and comes with three 140mm pre-installed Riing RGB fans: Two at the front and one at the rear. You can only install two 140mm fans at the front, however, you can install 3x 120mm fans at the front if you want more cooling. There is also space for installing a 240mm radiator at the base. As the case is fully modular, you can take apart most of its components and easily configure your RIG. For installing storage devices, the technique used is really appreciable. There is a drive cage with 4 drive bays at the front which supports HDD as well as SSD. It doesn’t require any screwdriver and at the back, there are three slots in which you can either install 3x HDD or 6x SSD. The only CON I found, in this case, is the absence the of PSU shroud. 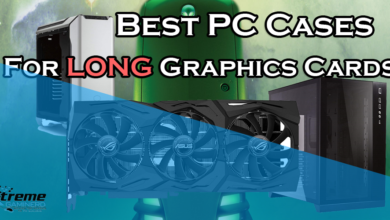 Otherwise, it’s perfect for building a high-end gaming PC. Or if you want to cut out some cash, then View 31 RGB is the way to go. This is the case which I own myself and I am very happy with it. 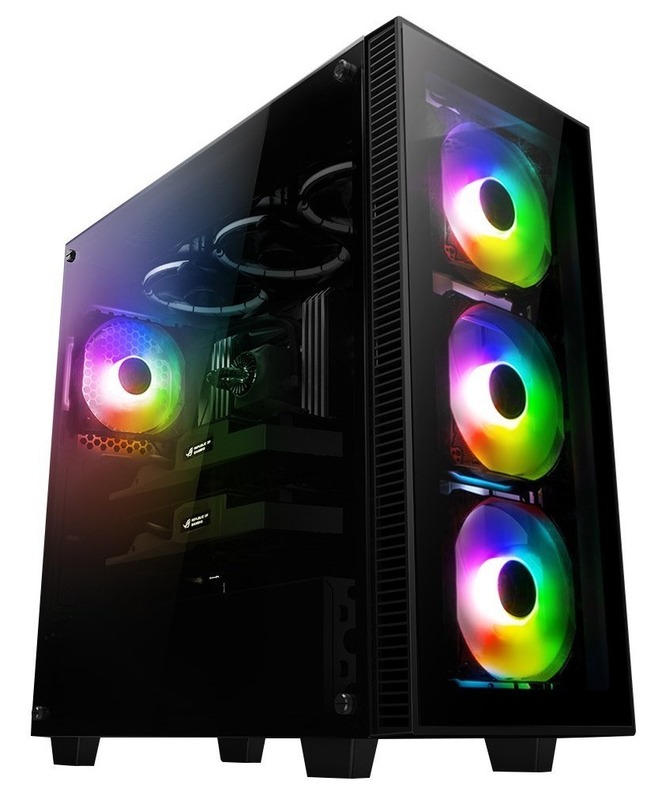 The case is similar to the View 71 RGB as it has 4 tempered glass panels and comes with 3x 120mm SP RGB fans pre-installed at the front for intake. The case can support 280mm radiator at the top and up to 360mm radiator at the front. The radiator support is not that good as of View 71 RGB but it is also less expensive than the View 71. The case is a little older than the View 71 RGB but it’s one of the first cases that featured 4 side tempered glass panels. It also has a PSU shroud that is not covering the whole base but covers the PSU and most of the cables easily. 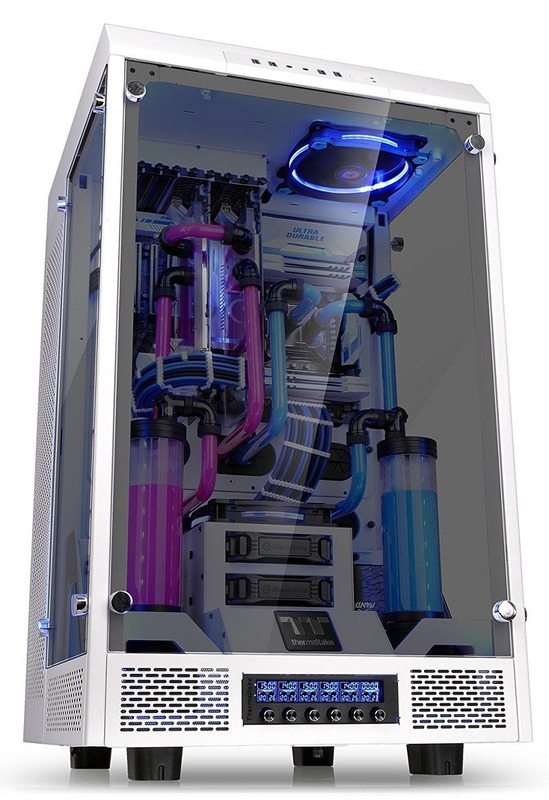 It fully supports custom water loops and every AIO cooler. 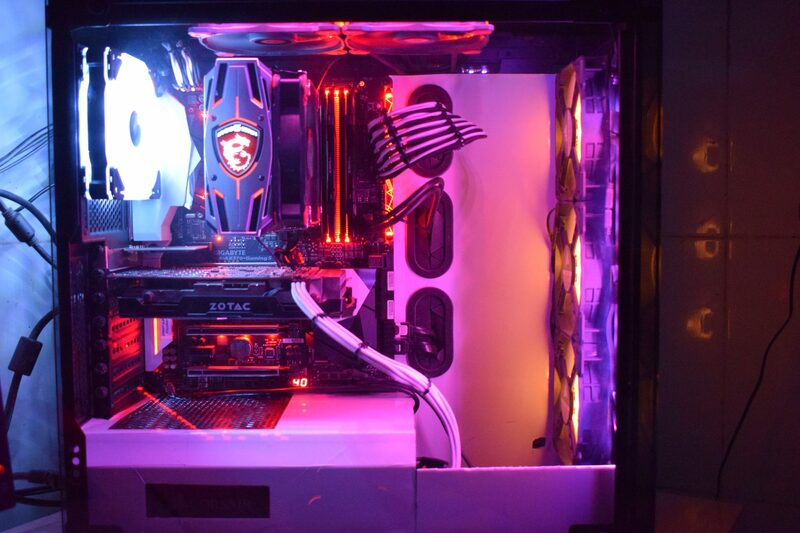 The fans pre-installed are connected to a hub which is present behind the motherboard tray and controls the lighting, effects and speed of effects of the fan. The buttons are present at the top but it doesn’t have a reset button. It’s also one of the first cases that used the idea of mounting the hard drives and SSD’s behind the motherboard tray and there are two drive bays for installing HDD’s and two bays for installing SSD’s. Cable management, in this case, is also very easy because there are multiple straps which can bind all the thick wires together and there is also a metal cover that hides all those wires, although it will be difficult to cover all the thick cables with that cover if there are too many cables tied together. The case, in my opinion, is a little overpriced when its performance per dollar is taken into consideration. 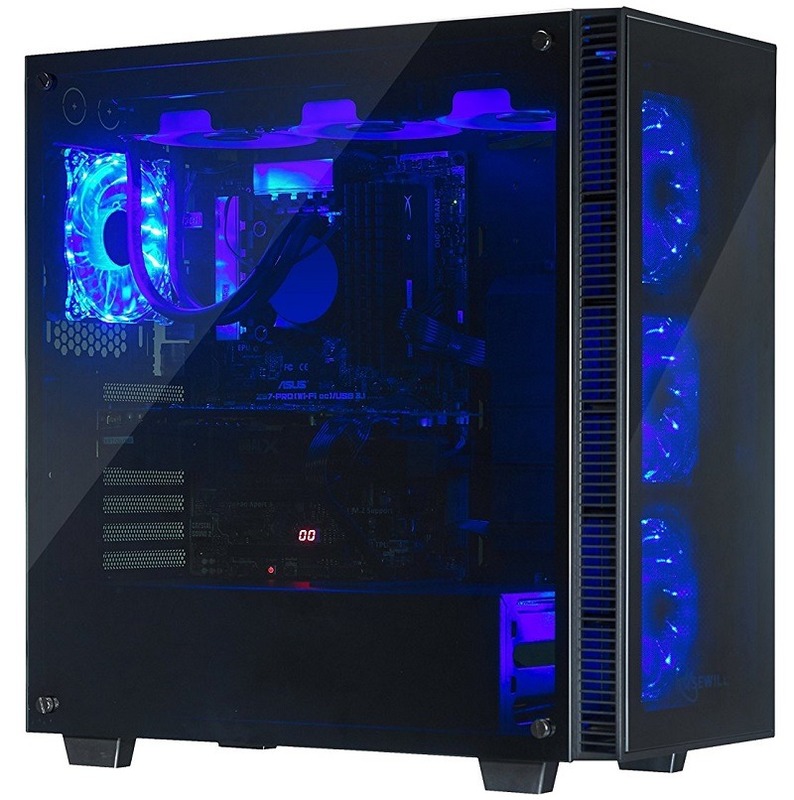 Although if you like the looks of this case because of the fans and tempered glass, then this case will not disappoint you. Take my word. This is an underdog case and I am sure it’s unlikely that you have heard the name of this company called Anidees but I was in search of the best-tempered glass cases and found it’s Crystal Mid tower which is bought by several customers and has regarded it good value for the price. 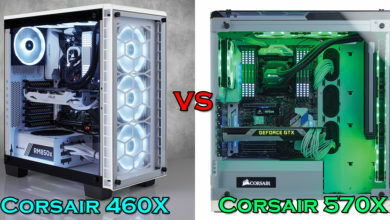 Definitely, it’s not as good as Corsair 570X or TT View 71 but it’s close enough in quality and support for components. 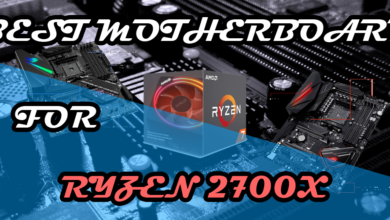 It’s much more similar to the 570X and features similar performance. The case comes with 4x 120mm RGB fans with a controller that can support up to 8 RGB fans which is better support than the 570X is having. The case also supports 360mm radiator at the top and 360mm radiator at the front which is a huge pro. It also has full PSU shroud that ends up a few centimetres away from the front panel so that you can install a radiator there. The PSU shroud also has 2 drive bays for installing HDD’s and at the back of the motherboard tray, there are slots for installing the SSD’s. Cable management is also fine in this case. It’s not the best but it will be easy to route cables through the routeing holes and there is a dedicated cover for routeing the ATX 24 pin power cable and other cables at the right side. PSU shroud also has one routeing hole with a rubber grommet and is very useful for connecting the cable to the graphics card. There are 2 tempered glass panels: one at the side and one at the front. These are the main areas where tempered glass is a must. Rest of the areas do not need transparency. 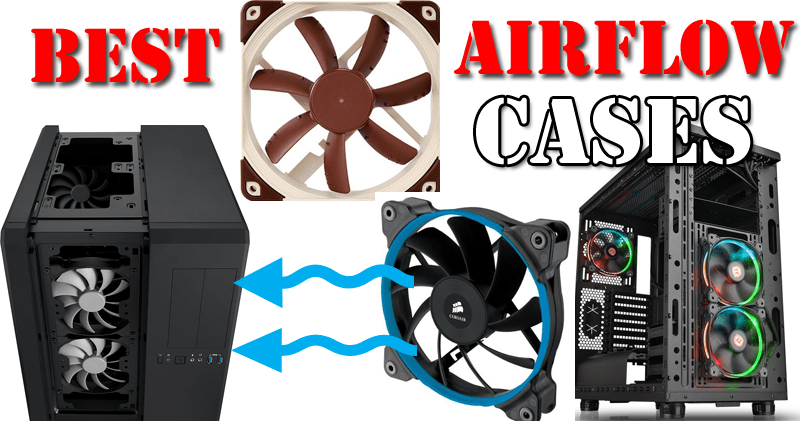 The case takes cool air from the side at the front panel and the fans are of normal quality. They aren’t as good as Corsair SP series fans but they will do the job fine. For a price of $150, this is a good choice for building a beautiful Rig if you want to give a try to a less popular company like Anidees. In other words, it can be said that either Anidees copied or Rosewill copied the design. 90% of the design is same and you can’t even tell the difference if you don’t know how to examine a case. One difference I found out is that the fans in Rosewill case are pre-installed inside and that of Anidees on outside. Otherwise, there is same length PSU shroud with one rubber grommet cut out. The support for 360mm radiators at the top and front are present in both of the cases. The cable cover inside is also exactly the same. The HDD bays are present in the PSU shroud in both the cases and the tempered glass panels are at the front and at the side in both the cases. So, they are identical but the quality of the Anidees case is a little better but it’s because that’s much more expensive than this case. The price difference is almost double. The Rosewill case comes under $90 while the Anidees one is for $150. So definitely you should go with this case if you think that a little better quality doesn’t justify Anidees case’s price.